Join a vibrant community of public relations practitioners who count on PRSA for their professional needs. Our members represent business and industry, counseling firms, independent practitioners, military, government, associations, hospitals, schools, professional services firms and nonprofit organizations. PRSA is the world's leading advocate for public relations and communications professionals. As a member of our community, you will meet others, engage with experts, learn new public relations and communications strategies, shape your communications career, and have opportunities to participate in networking and leadership at the local and national levels. 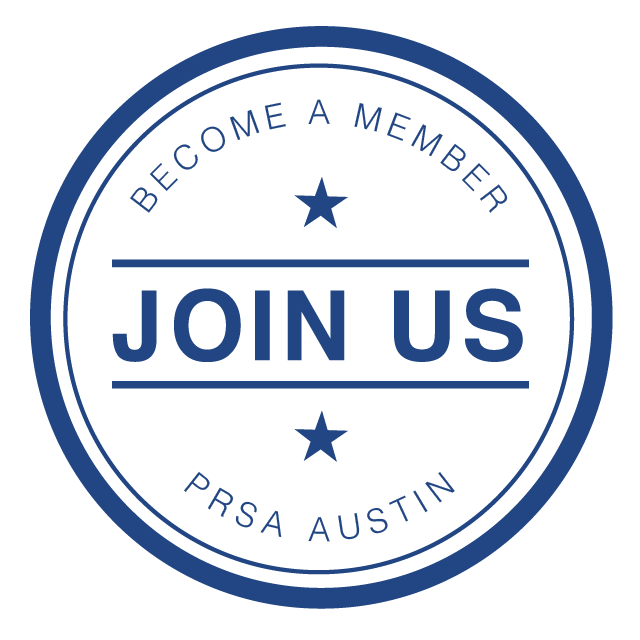 If you have any questions or just want to find out a little more about becoming a member of PRSA Austin Chapter, contact our Membership Chair, at [email protected]. PRSA Issues and Trends delivers daily industry trends straight to your inbox. Public Relations Tactics award-winning flagship newspaper. The Strategist magazine delivers executive-level competitive insight. Public Relations Journal, an online journal showcasing original research. Chapters deliver your membership experience in your local community. Professional Interest Sections focus on issues, trends and research in specialized practice areas and industries. PRSA LinkedIn Group. Seek expert advice from peers and grow your network. RFP Exchange. Search or post your own RFPs to grow your business opportunities. College of Fellows, an elite group of practitioners with 20 or more years of experience. PRSSA. Connect with the world's largest public relations organization for college students. Leadership. build your experience and reputation through volunteer leadership. MyPRSA. access and manage your Member-only benefits including our directories and e-groups. Members-only database of case studies, articles and research. Professional Development preferred pricing for PRSA members to our seminars, boot camps, webinars, teleseminars and conferences. Conferences. Learn new strategies and network with peers at conferences held nationally and for specialized practice areas including social media. Jobcenter. Make your next career move, receive job alerts and access career advice. Accreditation in Public Relations (APR). Distinguish yourself and gain a professional edge with the only professional public relations certification program. Members are eligible for a $110 Accreditation Examination rebate. Mentoring. Receive the career guidance you need from seasoned professionals. Awards. Be recognized for your excellence and accomplishments through the profession's most prestigous awards programs including Silver Anvil. Log in to MyPRSA to participate in these programs. Comprehensive relocation services for self, employee and corporate office relocations. Insurance for Members and Chapters. Receive preferred rates on insurance for yourself, your family and your business. Financial Planning Assistance for Members and Chapters. Complimentary access to financial planning assistance and personal finance articles. FedEx and FedEx Office. Save up to 27% on select FedEx® shipping and business services. Budget and Avis Car Rentals. Enjoy special rates with Budget and Avis.